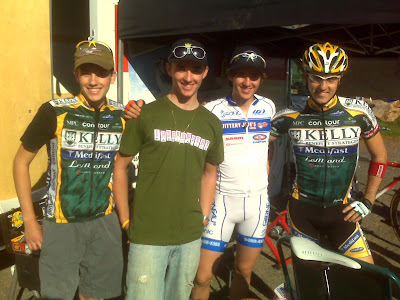 The two in the middle will be in Hoogerheide, Holland to contest the world cyclocross championships this weekend. Luke is in his final year as a junior (U19) and Nick is in his first year as an "under 23" (U23). Luke was 10th last year at worlds and is looking to improve on that. He has done well in European cross races this season including top 5 placings against the very best in the world, not to mention first in the Verge New England Series despite being in Europe for most of the season. He went to Belgium in October and did several races before returning home for the US Championships where he finished in second place. Nick hasn't done the Euro scene yet this year but is ready for the challenge. He won the Verge New England series for U23 and was second at Nat's for the U23. He is now ready to take his game to the Euro level. What did you do with your life by the time you were 19? Did you compete in a world championship in anything? National spit ball championships? New England alphabet burping competition? State hot dog eating festival? Dunk the clown at the county fair? No? Me neither. These kids, and their brothers, are off to a huge head start on life. I'll admit it, I'm a bit jealous. Until I figure out what it is that I am world champion quality at, I'll just have to live vicariously through them.